“Whittier College about to get littier college tonight,” said this Whittfest’s headlining artist, Tory Lanez. He had the crowd going wild . . . for 34 minutes. The second annual Whittfest event had been in the making since T-Pain walked off-stage in 2017, and that year-long planning process paid off on Friday, April 6, 2018. Whittfest was met with great excitement, before it abruptly ended. Program Board and KPoet kicked off the night with their new event called KFest, a collaboration of Whittier’s previous KChella and Springfest events. It took place on the North Lawn, with plenty of grass space for tables and events. Activities included body paint by Team M&M, balloons, hair glitter, live music, a photo booth, tye-dye, and a rock wall. This event engaged students on campus before directing their attention to the Upper Quad for the main event. Fourth-year Carly McAllister has been a fan of Lanez for years and was ready to share the experience with peers. “Engaging different parts of the community together to enjoy music? That’s awesome," said McAllister. "I’ve listened to him since I was a little kid so I know his music. I’m excited.” Whittfest doors opened at 6 p.m., but students did not start to filter in until the openers came on stage. 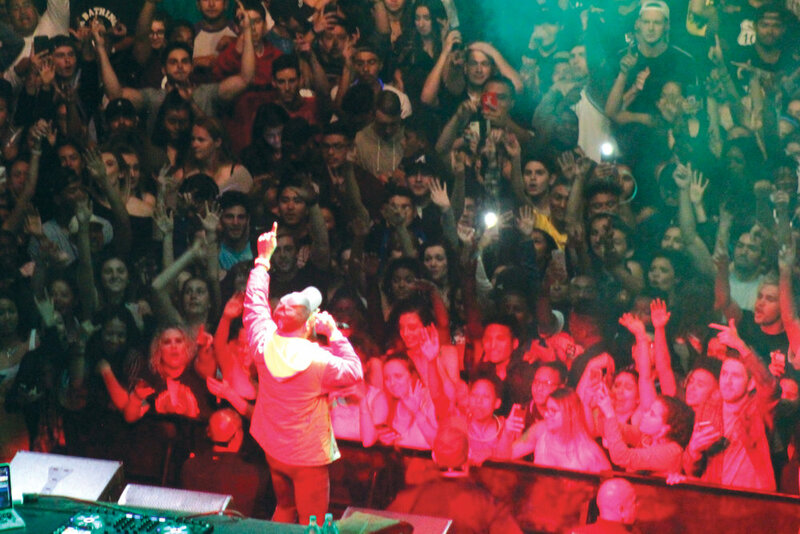 Two Whittier College artists had the once-in-a-lifetime experience to open for a big name artist that night. The opener for Lanez was Battle of the Bands winner Aaron Shreve, known by his DJ name, shreviewonder. However, he wasn’t on stage alone. Shreve invited Battle of the Bands competitor and friend Aaron Mazon on stage to share the excitement together. Hospitality Chair: works with the artist’s contacts, arranges food with BonAppetit, sets up the multiple Green Rooms that are needed, and ensures our artist is comfortable. Production Chair: works with our production company, and is there the day before/day of to assist where needed and be a liaison between the Whittfest team and their team. Marketing Chair: is responsible for our Social Media platforms (@Whittfest on Instagram and Twitter), marketing our event, and for the planning and execution of Battle of the Bands, which gives Whittier College students the chance to open for our headlining artist. Sponsorship Chair: Works with various organizations and departments on our campus, along with companies in our community, offers the opportunity to partner with Whittfest in various ways, and such that it will be beneficial for all parties. Whittfest’s planning and execution required work from a variety of parties. The Committee and the professional staff had to negotiate bids for artists, book sound, staging, and lighting; acquire food and beverages for the performer’s green room based on their orders, ensure that each vendor and contract is properly and accurately written, book the Whittier Police Department and an ambulance in case of an emergency, and secure the venue with the help of Campus Safety and the contracted security company. The contracted company, Contemporary Services Corporation (CSC), secured the perimeter of the concert area for Whittfest; the same company as last year. According to Associate Dean of Students Josh Hartman, CSC provides services for venues across the U.S. and are a well-known concert, festival, and special events security company. Despite their reputation, somes students expressed concerns that people of color were being targeted by security. “These reports are very concerning, and I would encourage students who have knowledge or experience supporting those assertions to bring them to me or to file a Bias Incident Report,” said Hartman. “We contract with a variety of vendors and we expect that they adhere to expectations of inclusivity that we as a College hold dear, and I would like to address specific concerns with the company so we can pursue action as necessary and appropriate moving forward.” Hartman’s office is located under the Campus Inn within the Dean of Students Offices. The turnout was only slightly less than last year, with 850 counted guests. According to fourth-year Chris Montelli, 34 minutes wasn’t enough time with the guest artist. “It was shorter than what I was expecting,” said Montelli. While there have been many rumors on campus about why Lanez might have left the stage early, there is no verified answer. “That [student] dissatisfaction extended to the Whittfest Committee and to the people who were backstage, also. [It was] made clear to the tour manager backstage, and our booking agent.” Lanez performed for 34 minutes, however he was contracted to be on stage for a 60-minute show. “We are trying to figure out the best way forward, and are concerned because the College didn’t get the full show as contracted,” said Hartman. Lanez did, however, attend the meet-and-greet after the show as contracted.